Some watch bloggers and journalists spend all their time in Geneva, Switzerland, looking for exclusives and scoops. They go on press junkets to the annual Salon International de la Haute Horlogerie (SIHH) watch show. 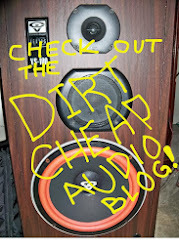 Only this blogger is willing to make the sacrifices needed to find a completely new brand that will sell thousands of watches over the next few years. While this new brand may never appear in The Robb Report or WatchTimes, according to The Millionaire Next Door , this is precisely the kind of watch that real millionaires wear. To find it, I had to go where other horology bloggers fear to tread. I had to get the exclusive spy pictures that no one else has. I had to go to Walmart. I slipped into the big box retailer under the guise of picking up a loaf of bread and some dog biscuits. Since these items were sold on completely opposite ends of the store, I was easily able to detour through the watch section. When I did so, I quickly discovered a watch brand that I had never heard of before. It was hidden in plain sight. It's a brand called Eclipse and it was created by the watch experts at Armitron. While I had to hustle home for a hungry hound, I did get a chance to take a quick look at these watches and bring you these world exclusive spy photos of Eclipse watches. The five watches I saw were men's quartz watches that would be suitable for the office, church, and business casual work environments. The designers of these watches couldn't fall back on hundreds of years of horological history, call whole summers a holiday, and demand big bucks. Instead, they were likely challenged by the quality benchmarks and low price points demanded by the notoriously tough fashion buyers at the world's most famous big box store. 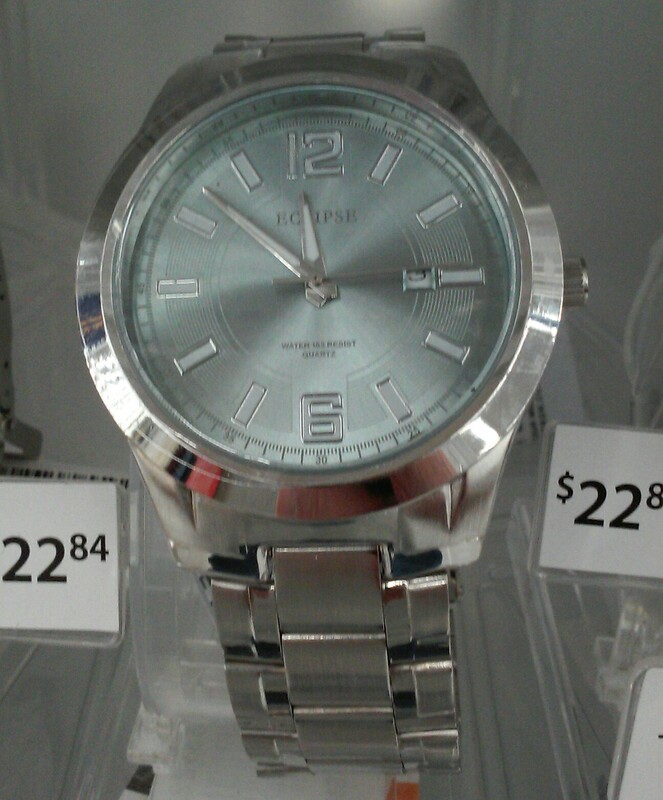 The resulting watches look nice, are most likely quite reliable, and were priced to move at only $22.84. The first of these watches mixed silver tones and gold tones quite effectively in a water resistant, quartz-movement, package. The second watch was the Eclipse take on the basic field watch with a genuine leather band. It was quite readable, offered 165 feet of water resistance, and even had a date window. 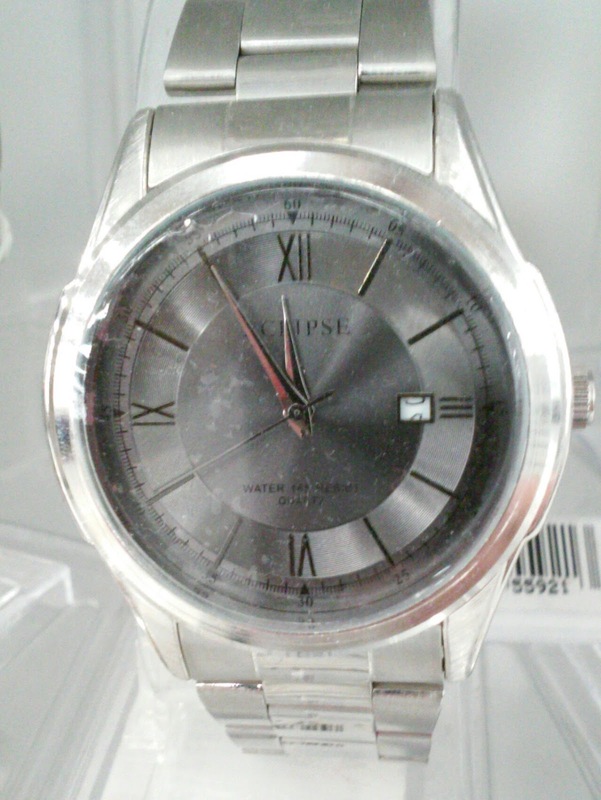 I love silver on silver watches and the Eclipse by Armitron brand obliged with this basic beauty. 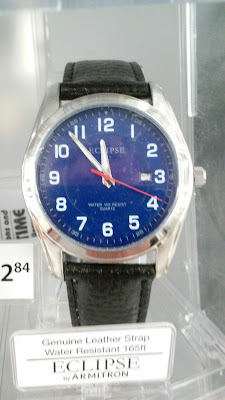 I really do like basic watches of this style and I think this one has a very nice design. Of course, intelligent discourse and society sophisticates insist that every man have at least one watch with Roman numerals on the dial. 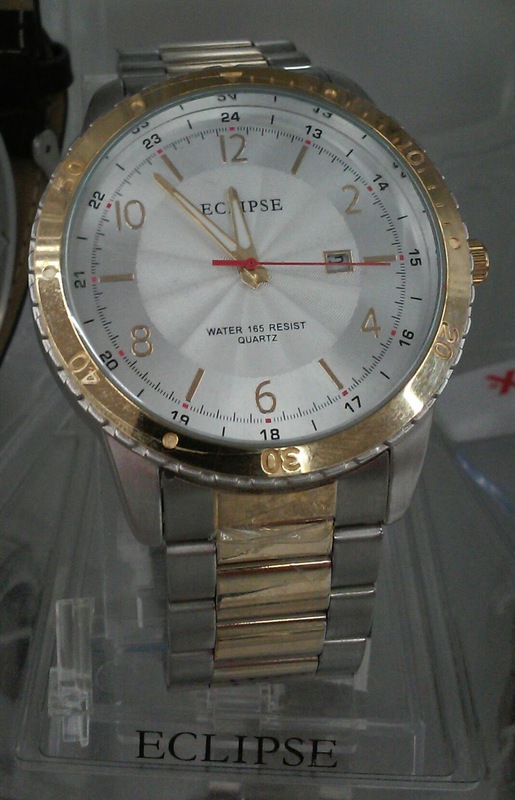 This Eclipse obliges and has a bit of a sunburst on the dial. 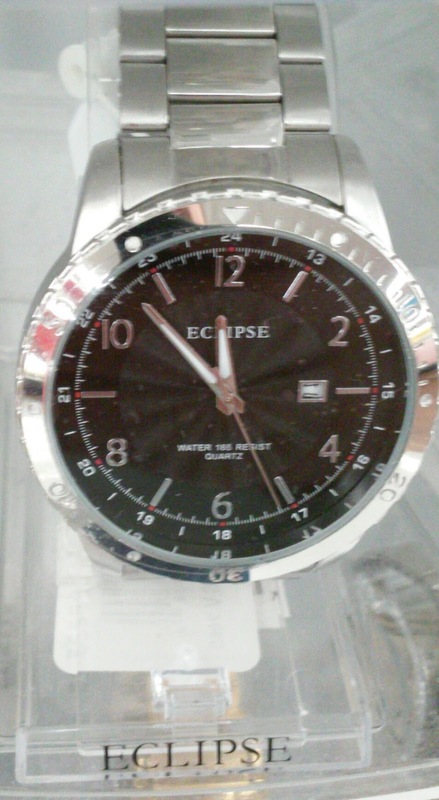 This final Eclipse watch had a dark dial, a sunburst, a date, and clear, readable numbers. To me, it's not the brand's strongest effort because it has too many disparate style elements that detract from the unity of the design. When I searched for the brand using the google shopping search, I saw that they had plenty of models to choose from at Walmart. At this price point, you get a decent working watch backed by the recognizable Armitron brand. They also seem well differentiated from the $10 to $15 watches available on nearby shelves. While they might not be shown or even worn in Geneva, these timepieces have their niche and fill it well. 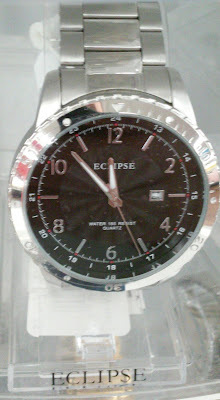 Picked up one of these "Eclipse" watches today at WM. Looks really nice! These seem to be pretty nice for the price. Glad you like it! 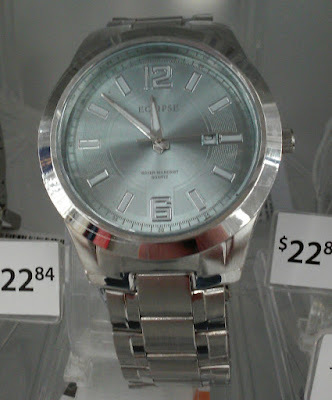 Armitron makes pretty decent watches and you just can't beat that $22.84 price! The Independence Series from Minuteman Watch Co. Celebrate the Clemson Tigers with a Watch!